This time of year is rich, full and more than just a bit busy! Since our Los Angeles weather has barley changed since last spring some hardly notice anything, but many of us are going through huge milestones! My daughter started high school in a new part of the city with all new friends. Some send their babies off to pre-school or kinder while others are simply adjusting to new grades and more structured days and that thing called homework! While I am still busy it certainly feels like I have more time for me. I don’t say that lightly as I can fill up my days quite easily, but I say it with determination that I spend more time on myself! It goes back a few weeks when I looked in the mirror and really paid attention to what I saw. I love food, I am after all a chef, but I was really not happy. Now usually I prefer to go under the radar with these things and just have people wonder if I changed my hair or did something and not announce to the world that I am actually trying to loose weight! There I said it! OK so here goes. Exercise daily for at least 30+ minutes- Non-negotiable. I love to hike, dance, do yoga, play tennis and ride a bicycle. I think thirty minutes is a fair gift to myself! I went to my collections of DVDs and dusted off some of my favorites! I have everything from yoga to Pilates to “Dancing with the Stars.” My all time best is a series called Yoga Bootie Ballet. http://www.beachbody.com You can zip over the hill to Serve Studios and take a class or if you are short on time put one of the many different workouts on and have a party in your living room! The last thing is what I call mindful eating. I get to play with wonderful recipes that are just a little bit lighter. I would never be the one to not eat or give up a certain food group, but we all know how to make better choices and being mindful allows for that. So find some time to get your groove on and enjoy these mindfully delicious recopies and your friends and family may never know exactly what you are doing, but you will look and feel fantastic! This simple marinade works well with chicken or fish. Eggplant, summer squashes, asparagus, inions, beets, corn. Just to name a few. Be creative and look for fun veggies to grill! Remove and grate zest of limes and juice limes. Prepare 12 cups of vegetables for the grill. Combine ingredients and marinate for 2 hours rotating occasionally. 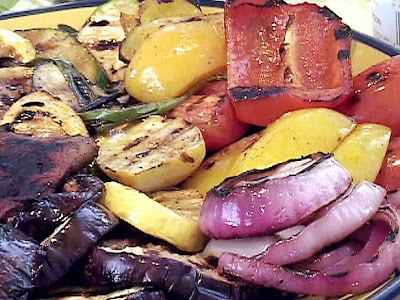 Grill vegetables, brushing with marinade. A very simple and amazing way to prepare shrimp. I have the biggest rosemary tree in my yard so I am always looking for ways to use it. Cutting 2 inch pieces of rosemary strip stem starting about 1" from top of stem. Using a very sharp knife cut points at the end of the stem. You will need about 25 for this recipe. In a large bowl stir together garlic, minced rosemary, and 3 tablespoons oil and add shrimp. Marinate shrimp, covered and chilled, at least 4 hours or overnight. Thread the shrimp with the rosemary skewer. On an oiled grill or a stovetop grill arrange shrimp so that the rosemary skewers are away from the flame. In a small bowl juice the lemon and add 2 teaspoons add two teaspoons zest. Combine the oil, mustard, vinegar, garlic, ginger, and black and red pepper. Cut the swordfish into 24 equal pieces. Cut onion in half and each half into quarters. Cut the bell pepper in half and de seeds it and cut into 16 pieces. Clean the mushrooms. Dividing equally and then alternating them, thread the swordfish with all the veggies ending with the cherry tomatoes on 8- 12-inch skewers. (Don’t forget if using wood they need to be soaked in water for about one hour. Brush with half the marinating mixture and let sit in the refrigerator for one hour. Prepare your grill. When it is ready, Brush the skewers with half the remaining marinade. Grill the skewers about 5 inches from the heat for five minutes. Turn over and grill about 5 more minutes until fish is lightly colored, firm to the touch, and cooked through, about 5 minutes. Serve at once. In saucepan heat peanut oil and sauté onions and garlic for 5 minutes. Add peppers and cook until softened stirring constantly. Add the black beans and stock stir over medium heat until thicken and sauce reduces about half. Puree with an emulsion blender. I like to leave it a little chunky. Cover while preparing the fish. Prepare grill. (These can be done on the stovetop grill o broiler as well.) Brush fish well with oil and sprinkle with salt and pepper. Grill or broil until cooked through about five minutes per side.) If you made the sauce a head reheat. Place fish on a plate and spoon over sauce and garnish with fresh cilantro. 4 tuna Steaks, 1/2 to 3/4 inches thick. Prepare the grill. Mix the oil and lemons and lime in a small bowl and brush over the tuna generously. Grill the tuna steaks 5 inches over the heat for about 6 minutes per side until they are firm to the touch. (Many people like there tuna rare…that would be about 3 minutes per side. I personally, like all of my fish cook through. Not over cooked, but cooked through. Believe me I have taken much flack about this from chefs over the years, just another lesson for being true to your own tastes no matter what the “experts” say. Remove from grill and serve immediately with a generous amount of salsa. cilantro. Best served within an hour or two of mixing.